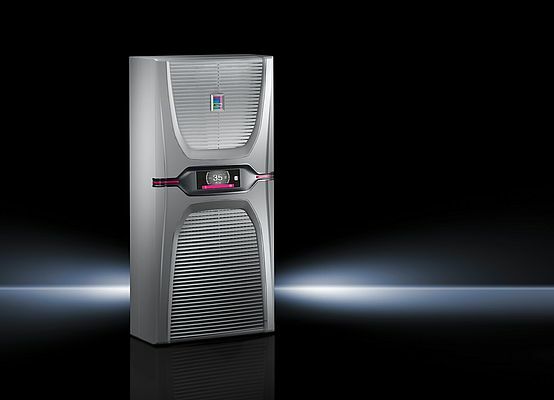 Rittal extends the Blue e+ range. The new unit will provide an output class as low as 1.6 kW, extending the existing range of between 2 to 6kW. The Blue e+ cooling units feature inbuilt, innovative, patented hybrid technology. This combines an inverter driven cooling circuit with an independent heat pipe to provide passive cooling. This has a significant role in delivering the unit’s exceptionally high efficiency ratings. The inverter driven cooling circuit of the new Blue e+ range is also rated as highly energy efficient. Frequency converters precisely adjust the speed of the DC motors controlling the fans and compressor via voltage control, which allows the cooling output to be tailored to the current environmental requirements and deliver demand-based cooling. This results in a significant reduction of energy consumption over conventional solutions. Precise, demand-based cooling ensures minimal thermal stress for components within enclosures, so constant temperature fluctuations (such as in the conventional two-point control systems) can be considered as a thing of the past. This not only increases the service life of the cooling units and enclosure components, it also means higher process reliability. All the units in the new range can be operated in all standard grids worldwide thanks to the innovative multi-voltage capability. Permissible input voltage ranges from 110 V (single-phase) to 480 V (three-phase) in conjunction with a mains frequency of 50 Hz or 60 Hz. Blue e+ units also excel in terms of connectivity, safety and handling. The units feature a graphical touchscreen control panel which displays all key information at a glance. System messages appear as plain text and are multi-lingual while standardised communication interfaces ensure easy integration into a production plant’s control systems. Meanwhile, the newly released IoT interface means Blue e+ units can link to customer-owned monitoring, energy management and/or superordinate systems via OPC-UA, Profinet, SNMP, Modbus TCP and CANopen, enabling predictive maintenance, data analytics and more. In addition to the CULUS listing, Rittal cooling units and fan-and-filter units also now have a UL listing in the new “FTTA” (Environmental-rated Accessories for Enclosures) category.